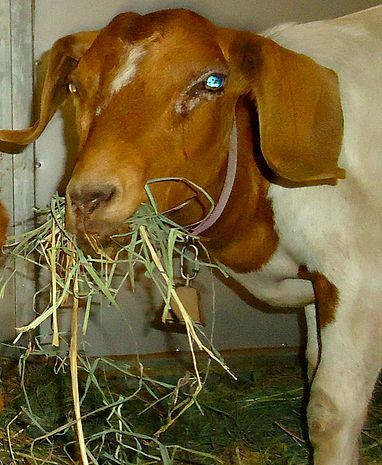 ​Gertie lived on a goat meat facility where she had recently given birth to triplets. The strain of the birth broke her pelvis. One of the baby goats, Stevie, was born blind. When the facility closed its doors, CAPE stepped in and brought both Gertie and her baby to live at the CAPE Animal Sanctuary. Gertie wears a bell around her neck so Stevie can easily find her.